Have you ever driven a semi-truck? If not, it may be difficult for you to understand just how dangerous it can be to drive an eighty-foot-long truck. Compare the eighty-foot length of a semi to the average length of a car, which is roughly fifteen feet. Also, consider the weight of the vehicles. Semis are used to transport vast amounts of material from place to place. For this reason, the trucks can weigh up to 80,000 pounds–compared to the 3,000-pound maximum that most passenger cars weigh. Imagine an 80,000 pound, 80-foot vehicle traveling at speeds up to 80 miles an hour. Does that give you a better understanding of the dangers associated with semi-trucks? It’s fun as a child to drive next to a semi-truck and motion for them to honk their horn. What’s not, fun, however, are the dangers associated with driving near a semi-truck. Statistics from the National Highway Traffic Safety Administration state that there are 450,000 accidents with semi-trucks annually in the U.S. alone. As a result, there are about 140,000 seriously injured people and at least 5,000 fatalities a year. Nearly 3/4 of the fatalities are the drivers of the passenger vehicle, the driver of the semi-truck is typically the survivor. We must be extra cautious on the roads when we are driving near a semi-truck. Raising our awareness of our surroundings while driving helps to keep us safe and prevents car accidents. Next time you’re driving near a semi-truck, keep these safety tips in mind. ● Beware of blind spots. Semi-trucks do not have rear-view mirrors–the trailer on the truck is too tall to be able to see behind; they must rely on side mirrors to see everything. Because of this, they have more blind spots. There are large distances on both sides of the trailer that the driver cannot see. Also, it’s difficult for the driver to see cars that are directly behind the truck. When you are more aware of the numerous blind spots semi-trucks have, you can avoid these areas to stay safe. ● Keep a safe distance between your car and the semi-truck at all times. Doing so will increase your visibility to the semi-truck driver. ● Because of the length and weight of semi-trucks, these vehicles need much more distance to come to a stop than your average car. 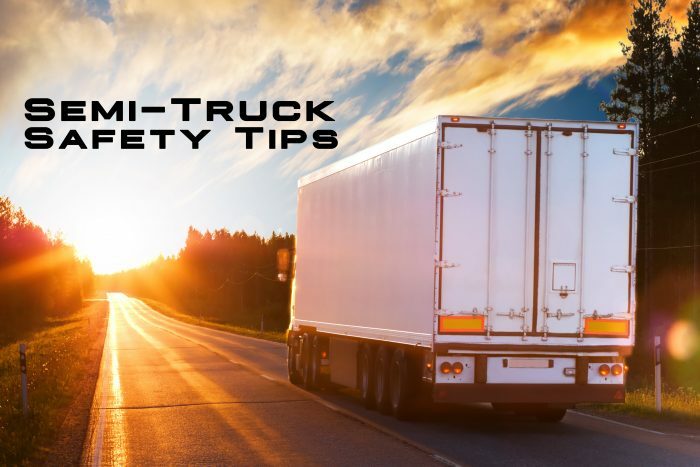 Therefore, passing a semi-truck then immediately coming to a stop puts your life in danger; the semi-truck may not physically be able to stop in time, resulting in a serious accident. ● Semi-trucks may also need an additional lane while making a right turn. Keep this in mind when you are passing a semi on the road. ● Pass with care. Use your signals to alert the other drivers on the road. When passing a semi, try to pass on the left side–it’s much easier for the driver to see your vehicle when it’s on the left side of the vehicle.